Location: Spiti Valley is a desert-like mountain valley located high in the Himalayas, in the north-eastern part of Himachal Pradesh. The name ‘Spiti’ means ‘the middle land’, and refers to the area between Tibet and India. 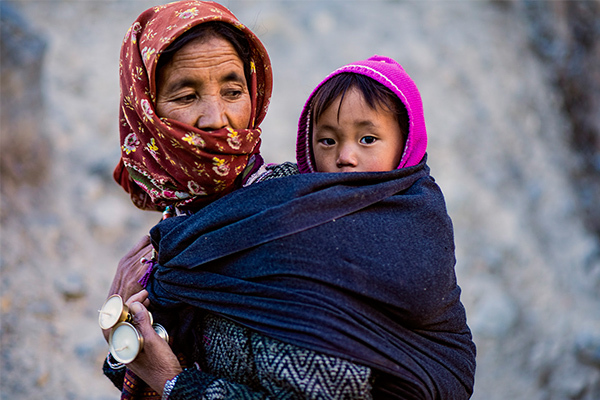 Moving Image: A woman with a child on her back, hikes up to the Dhankar Gompa, to light candles in the evening. The Dhankar Gompa, which once used to house over 150 monks, is now on World Monument Fund’s list of 100 most endangered sites. For the locals, it’s still a place of prayer, faith and tradition. Photographer: Mandar Parab is a photographer based in Mumbai. His work focuses on documentaries and photo essays. He has collaborated with various Indian publications, and recently his work has been exhibited at Galpon Fresh Face in Porto Alegre, Brazil.